I need to do one more post for the Romantic Times Convention. 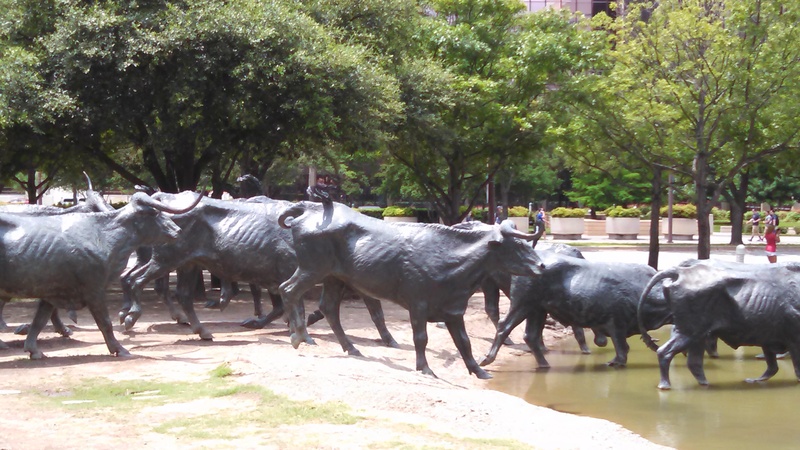 I returned home safely on Sunday afternoon, tired, but happy with the week I spent in Dallas. Monday I was exhausted. Today is the first chance I’ve had to blog about the rest of the trip. 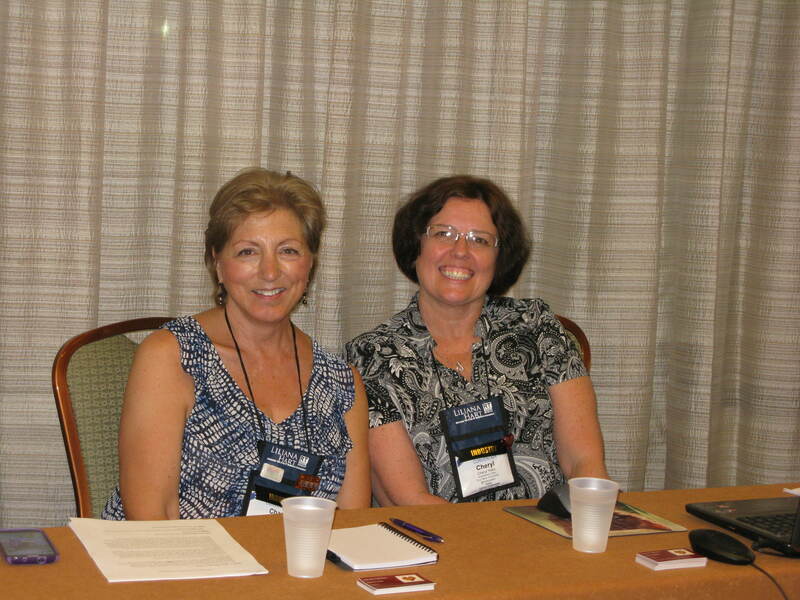 There were more workshops, parties, networking, and meeting wonderful people. 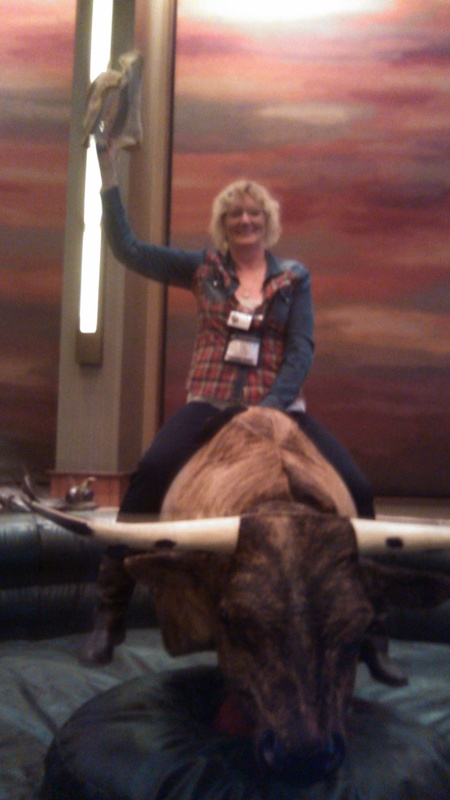 On the night of the western party, I sat on, but didn’t ride, the mechanical bull. Many did, including three women I met. One of them even rode it at high speed and stayed on longer than some of the “macho” men. Several of the men, including the buff models, thought getting on the bull was a joke and it would be easy. They learned differently, not making it past two seconds out of the thirty second time limit. 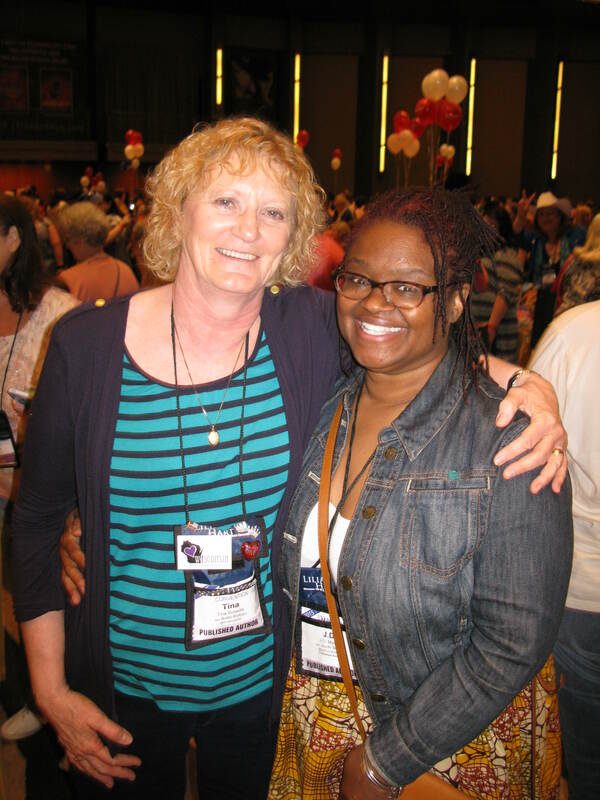 I met Tara Finney, a blogger, at a workshop and we kept bumping into each other. We spent time together one night over drinks. She was one of the women who rode the bull the full 30 minutes. I taped for her so her family would agree she really did it. It seems I’m always wearing the same top for book signings. I really do have other clothes to wear. I participated in the RT Club Author event twice. For half an hour authors sit at table of usually two or three other authors and talk with readers. It’s a way to get yourself known. 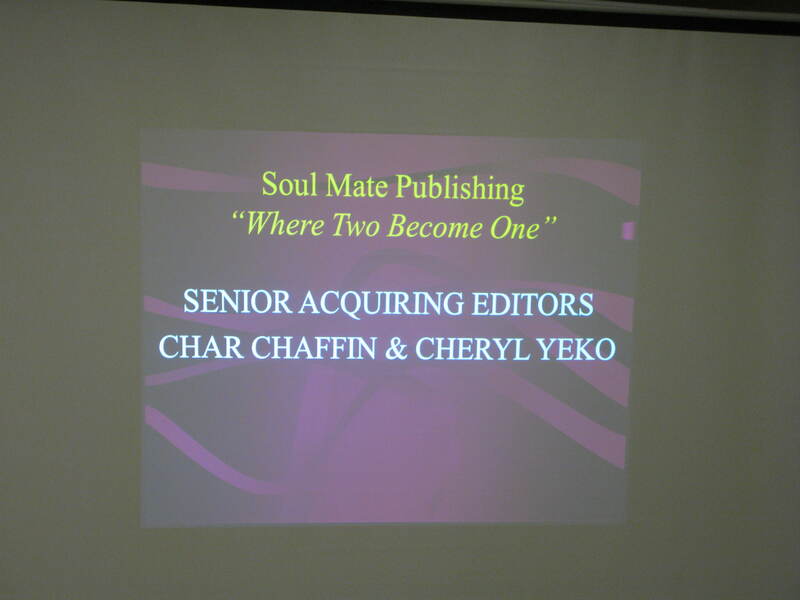 I also sat in on Soul Mate Publishing’s Publisher Spotlight where editors, Char Chaffin and Cheryl Yeko talked about Soul Mate and what they were looking for. We also all had supper together one night. 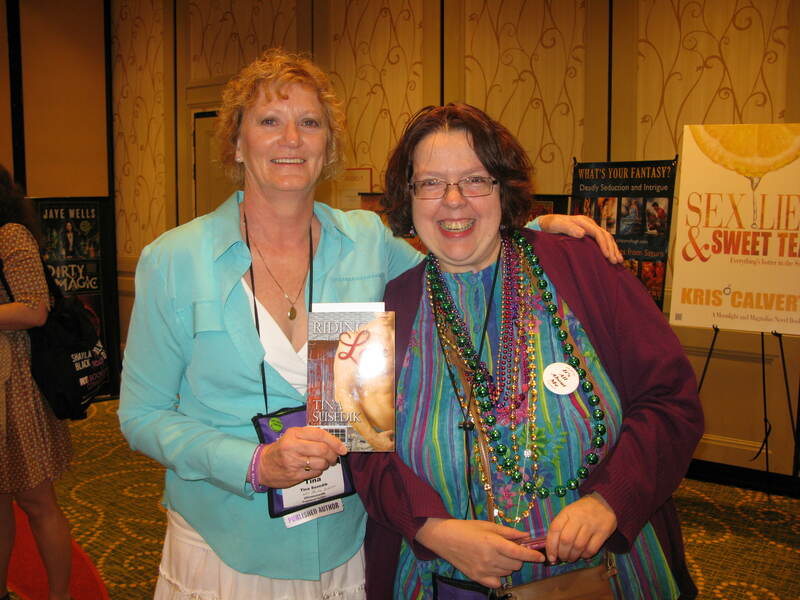 Char Chaffin and Cheryl Yeko, editors at Soul Mate. 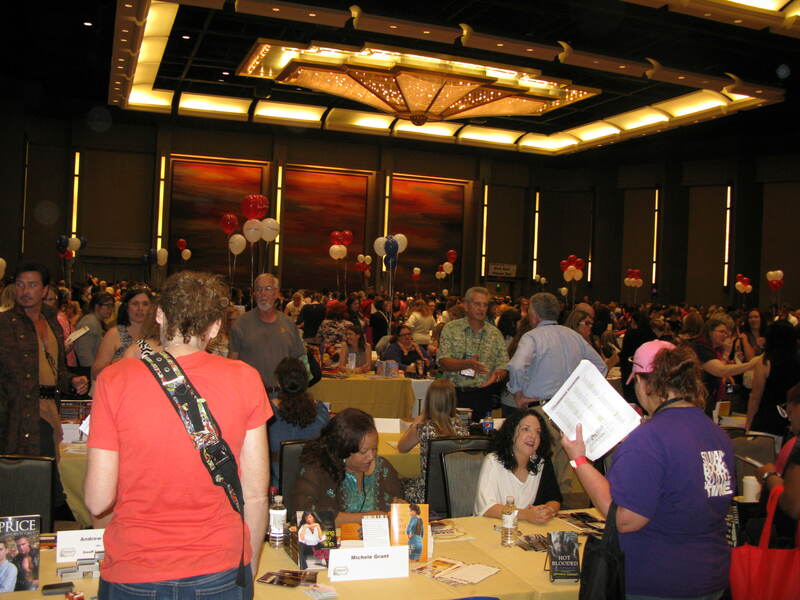 On Saturday was the big booksigning, with over 600 authors in attendance. I didn’t participate this year, but on the advice and urging of many, I believe I may do it in Vegas next year. The public is invited and thousands attend. Even after getting nearly forty free books, I just HAD to buy from my friends. I also had pictures taken with them. 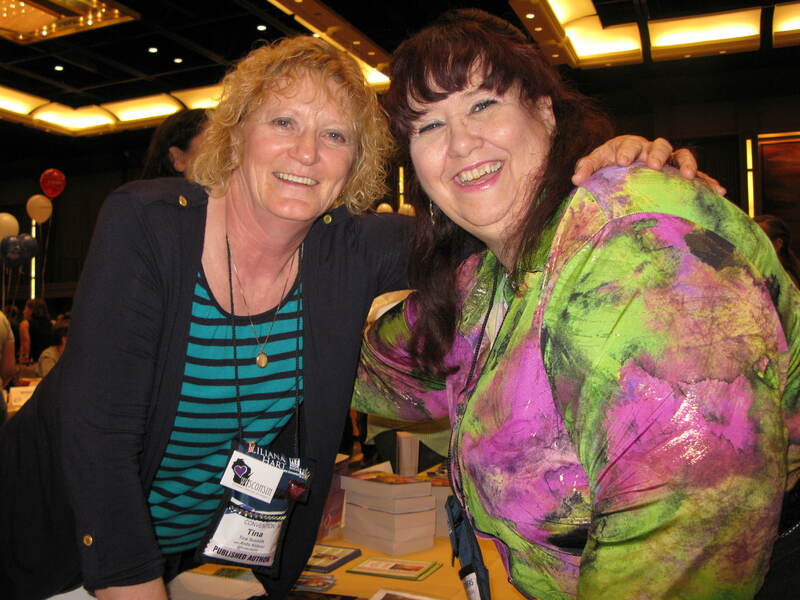 I met Renee Daniel Flagler at a workshop she and Lutishia Lovely ran about writing under two names. They were funny and informative. I bought their books at the booksigning. Lutishia introduced me to Zuri Day. 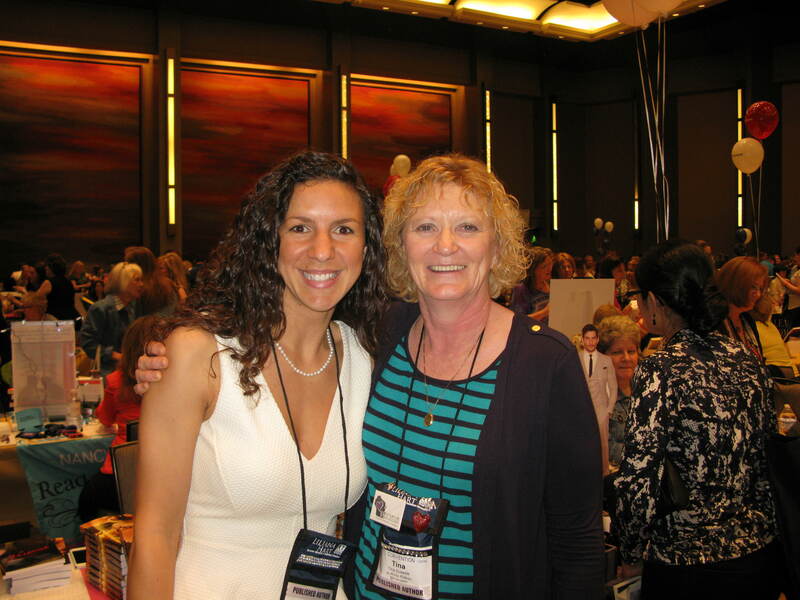 I met Deeanne Gist two years ago when my first book was released. 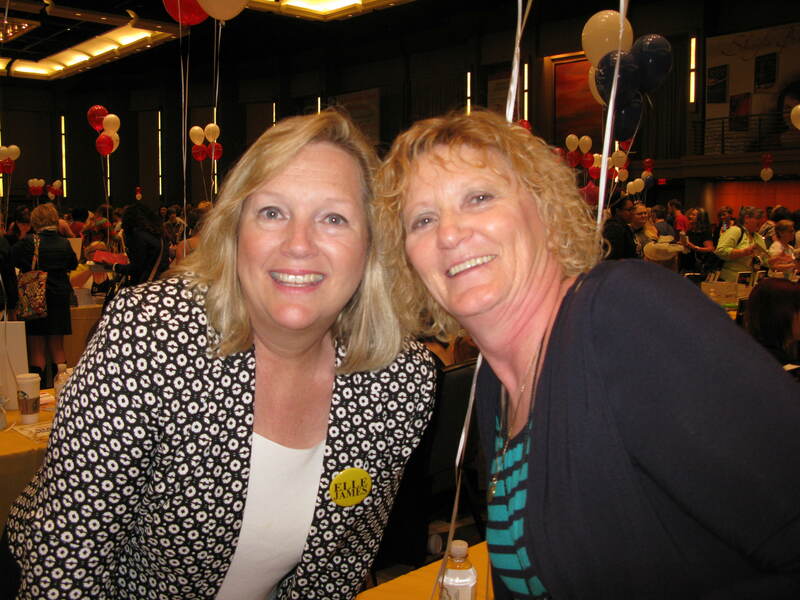 Then we met again at the Barbara Vey Luncheon in April. Sweet lady. Jules Berghammer and I have been FB friends for a while. We finally met at RT, only to find out we live two hours from each other! Tina DeSalvo and I met at the Barbara Vey Luncheon in April. We decided the Tina’s needed to unite. 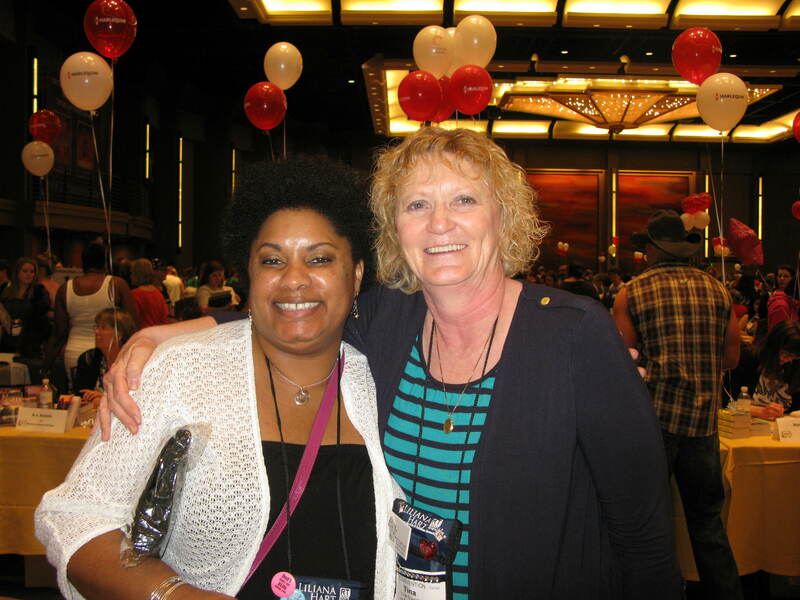 Naleighna Kai, who I see each year, introduced me to J.D. Mason. 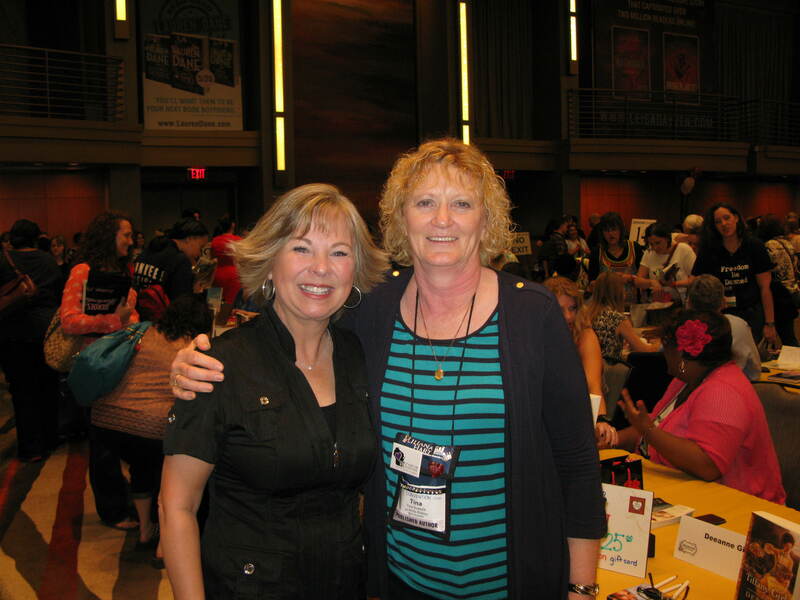 It’s always fun to meet new authors. Each morning, I attended exercise classes. This was our instructor. I simply can’t remember her name. 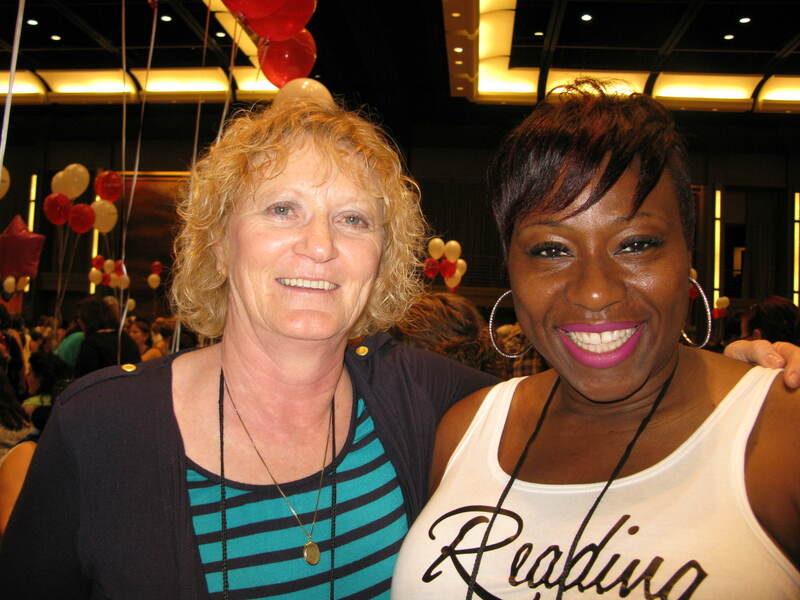 I won two books from her, but since my books are still in route from Dallas, I can’t find her name on them. One of my exercise partners, Elle James. Please don’t confuse her with that other author with a similar name. After the booksigning, Beth and I walked around downtown. We went back to the park we’d found on Tuesday. Only this time, we had our cameras. It was hot, humid, and very windy. Each year, Heather Graham, hosts a huge party. 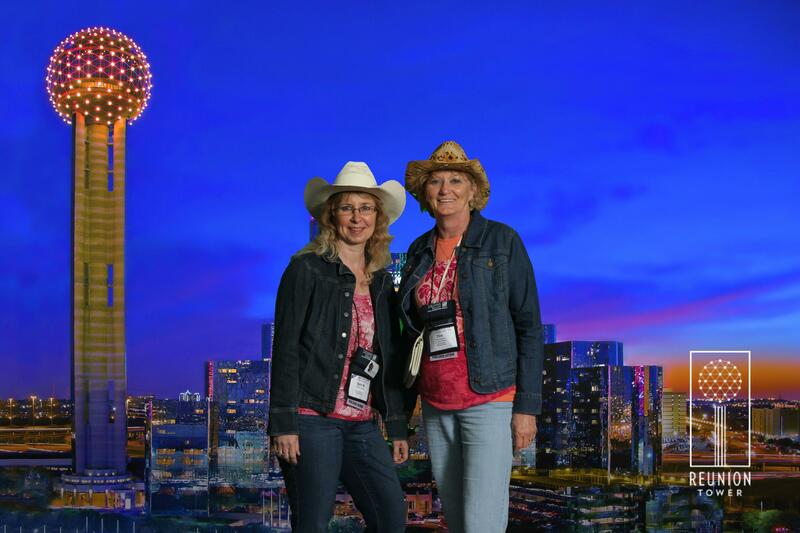 This year the theme was western. (Of course.) She, with her friends, put on a play. Always funny. Beth and I decided to go up the tower. We actually thought we were paying to go to the top to the restaurant, but we ended up at the observation deck. Kinda of a rip-off. Then we went to the restaurant where I had a $15.00 glass of wine. Really a rip-off. So it’s over. I’ve recuperated. The books I shipped home haven’t arrived, yet. When they do, it’ll be fun to see what I got. When I came back from the Romantic Times Convention, I had my blogs all lined up in order of when I would post them. 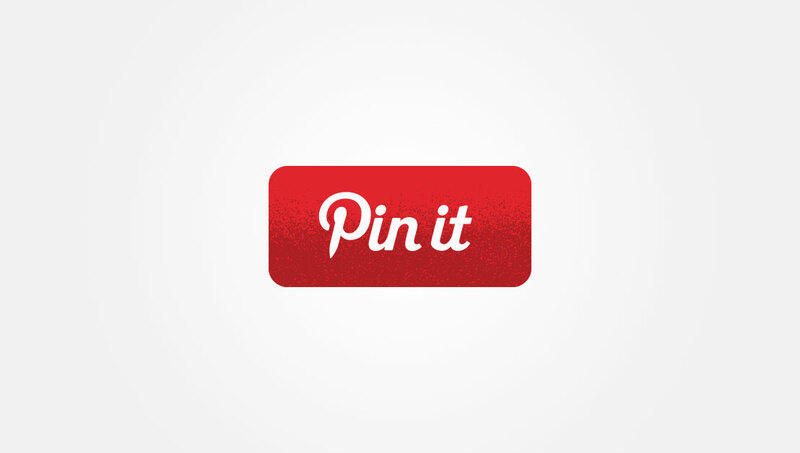 Life got in the way, and I ended up blogging about other events and missed one story. I did talk about some the people I met in New Orleans. I wish I could write about all of them. On the day before the convention started, I wandered through the hotel familiarizing myself with its layout. On the way down the escalator, I met a woman who was also scoping things out. We had lunch together. Unfortunately, I didn’t write down her name and I can’t remember it. Surprise, surprise! She was from Canada and this was her first convention. After lunch, I bumped into a familiar face from Wisconsin. We talked a bit, but since she and her husband were combining the trip with their anniversary, I didn’t want to intrude on their time together. I moved on. The noise in the lobby grew in time with the increased crowd. A couple times during the convention , I wanted to cover my ears as I walked through the lobby. The noise became horrific as more and more people arrived. 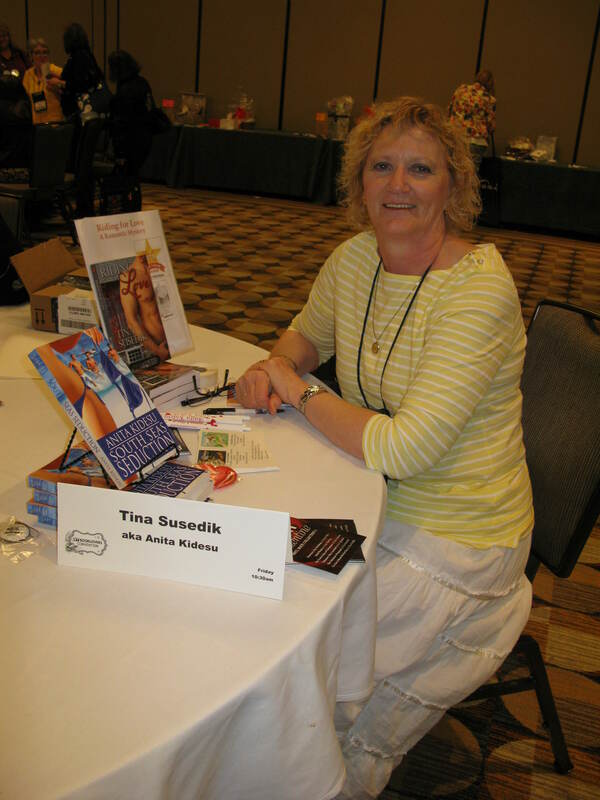 As I walked past tables looking for another author I knew, I saw a woman sitting by herself. Normally I’m a shy person, but when I’m alone, I can, at times, open up and talk to complete strangers. I went past the table and then backed up. For some reason, I wanted to meet her. It turned out to be a delightful way to spend two hours waiting for my roomie to arrive. With Julie. Doesn’t she have a wonderful smile? 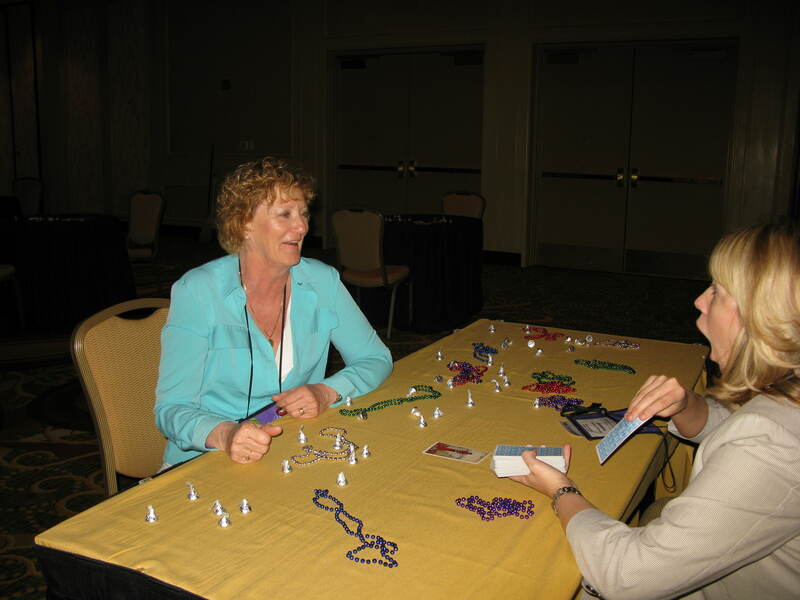 Julie LeVesque attended several conventions in the early years when RT was in its infancy. Due to illness, she was unable to make the conventions for several years. This was her first one back, and I was delighted to be one of the first people to talk to her. Julie is a reader, an avid reader. She is, like many of us, addicted to books. We discussed our favorite and least favorite authors, what genres we read and why we like the RT conventions. We talked about our families, friends and life in general. She took my card and said she definitely wanted to buy one of my books. Throughout the next days, I would bump into Julie and her friend, Robin, who is an aspiring author. Since we were both usually on our way to a workshop or event, we didn’t get to talk for long. One day I decided I wanted Julie to have one of my books. Wouldn’t you know it, then I couldn’t find her. I scanned the faces of those toodling around in their scooters, until I finally bumped into her and Robin. The pictures tell the story. Julie, if you’re reading this, I think of you often. I hope we see each other again next year. Friends New and Not so New – Enter to win an Amazon gift card. 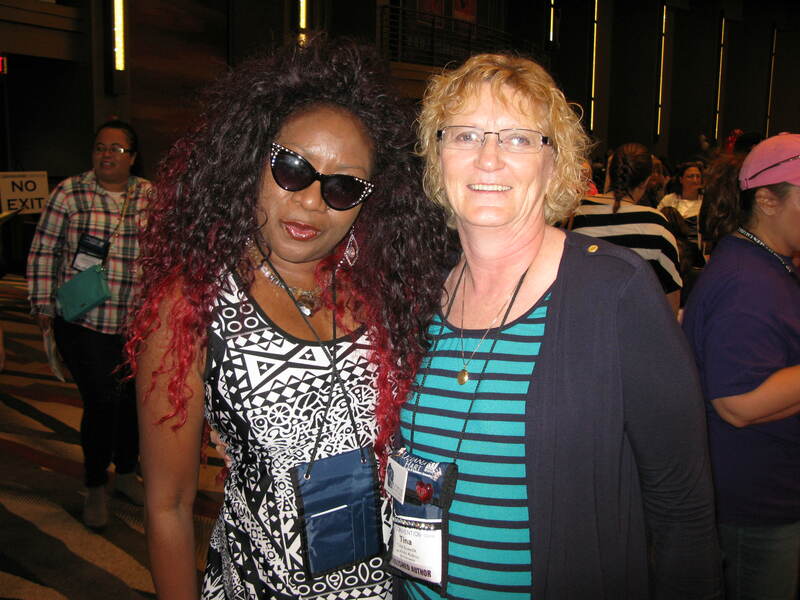 One of the great things about the Romantic Times Convention is meeting new people and re-connecting with those I’ve met in the past. Today I’m going to talk about two women, one I met last year, and one I met this year. Both are up and coming authors. Last year Beth and I met Sonja Rouillard. It was her first RT and my second. I can’t remember how we met, but we connected with this classy woman. She was promoting and looking for an agent to help her with her new project, Romance Readers Travel Guides. With painstaking research, Sonja has compiled books to help readers and authors find places around the world to visit. This year she is running a contest, which unfortunately ends tomorrow. Click on the link below to enter to win a $25 Amazon Gift Card. Win a $25 Amazon Gift Card!!! It’s not too late to enter. Check out the fan page for the Romance Readers Travel Guides and enter by May 28th. I met Kate Allure this year. Beth, Sonja and I spent a lot of time with her, helping her learn the ropes at her first RT. Kate is also running a contest. Hers ends May 31st. Kate’s first book will be released next year. I’m sure we’ll celebrate the occasion at the Romantic Times Convention in Dallas next year. Win a $25 gift card to Kate’s favorite “toy” store. Just visit debut author Kate Allure’s new website by May 31st and good luck! Day number two is history. This is the first time in the three years I’ve been coming to the RT convention that I didn’t attend a workshop in the morning. 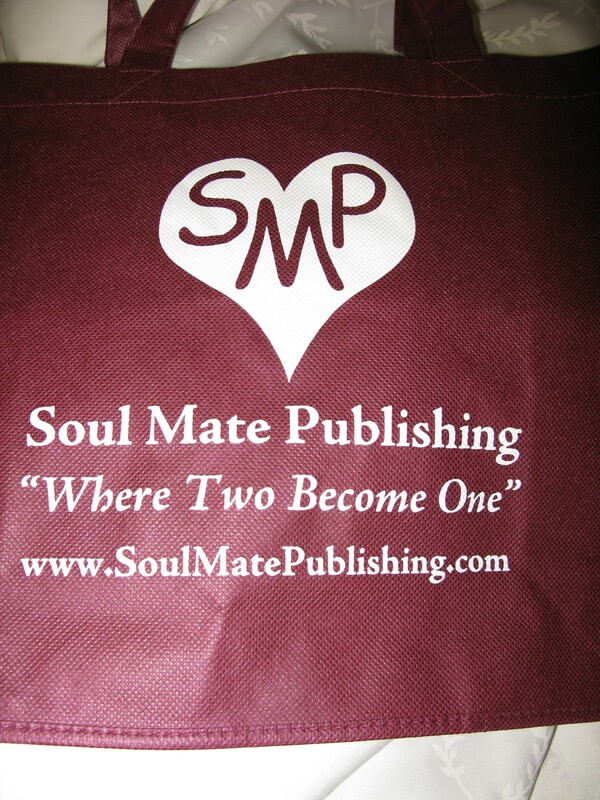 That was because eight of us Soul Mate Publishing authors put on a reader event. Unfortunately, the woman who instigated the event got sick and couldn’t participate. I understand she woke with an ear infection. We were scheduled for 11:15-12:15, so we agreed to meet at 10:45 to set things up and figure out what the heck we were doing. This was new to all of us. 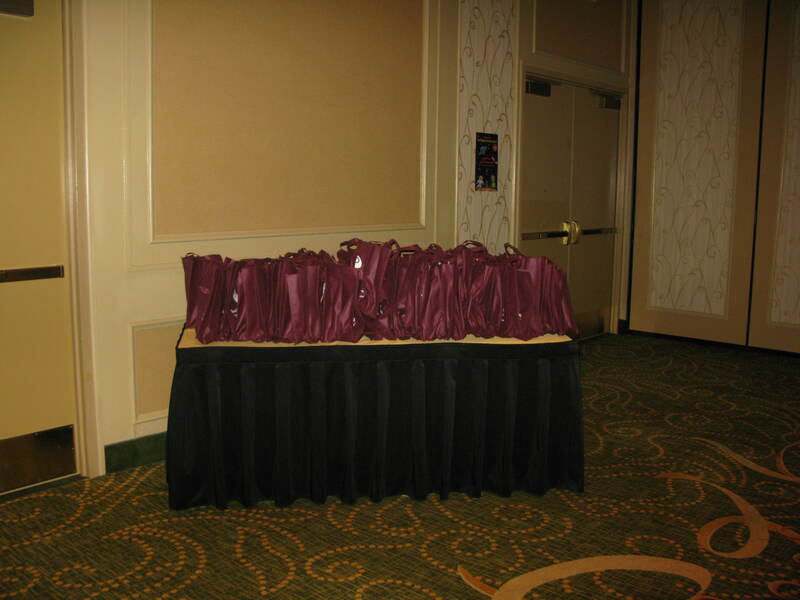 The day before, when we were stuffing our 100 bags for the first 100 attendees, we all voiced concern as to whether anyone would show up. As I walked down the hallway toward our room, I wondered what event all these women sitting/standing in line were waiting for. I turned the corner to our room and realized, OMG, they were waiting for us! I can honestly say nerves set in with a vengeance. Some of the 100 bags waiting for new homes. I love the expression on Jessica’s face. While we waited, one of our fellow authors, Jessica Jefferson, practiced with her Tarot cards by giving us readings. I have no idea how on earth the cards work, but it was amazing how some of the cards were right on with my life. When Jessica turned over the first card for me, she told me it said I’d recently been in an accident. Wow! As I wrote in an earlier blog, the bus my husband and I had been on three days earlier was hit by a car. Jessica was shocked. We also grew more nervous as 11:15 loomed closer and our psychics hadn’t shown. To our relief, they arrive within two minutes of the doors opening. I shared a table with Geri Brousseau. Both of us were surprised at the line of women waiting to get our signatures on our book cards. 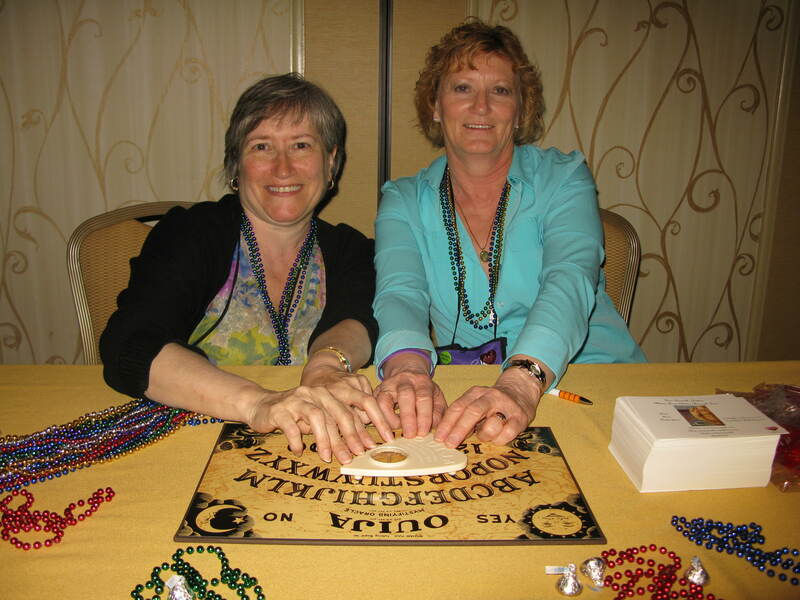 We also had one of the Oujia Boards at our table. Very few of the women waned to use it with us. They all said it freaked them out. I have to admit it is a little weird, but Geri and I decided to believe it when it moved to “yes” when asked if we would be on the New York Times Bestseller list. NYT Best Sellers’ list, here we come. 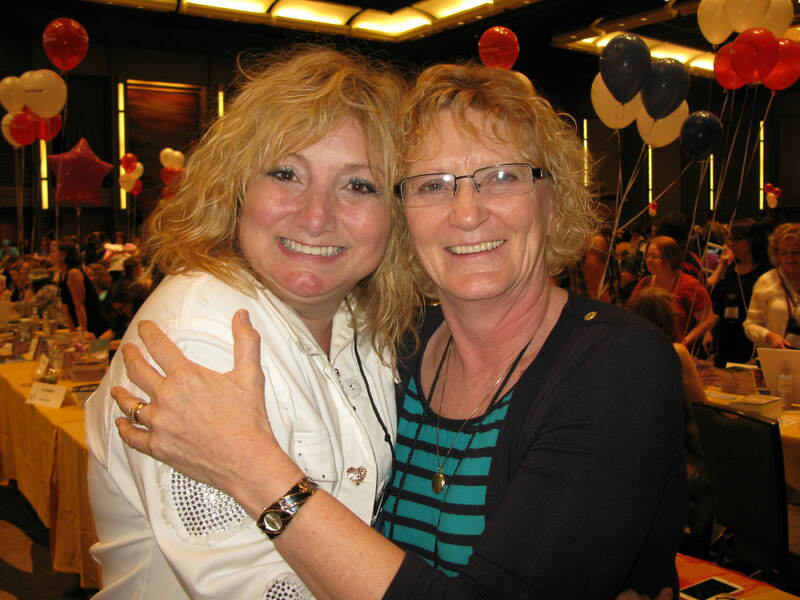 With Geri Brousseau. A very fast hour later, it was over. I’m not sure how many cards I signed or how many women I talked with, but I know it was a lot. And I only ruined three cards by being so nervous, I couldn’t write. Another fun part was seeing those women throughout the day and having them wave or stop to say hi. Jessica Jefferson, Susan Crowley, Geri Brousseau, Jaye Garland, Tina Susedik, Aliza Mann, Suzanne Sobol. Shelly Bell was missing. After the event, I ran across the street to my hotel to change back into jeans. I couldn’t stand wearing a skirt that didn’t have pockets to put my stuff in. Several of us Soul Mate authors then went to lunch on the French Quarter. I managed to attend two workshops in the afternoon before heading back to my hotel, and get ready for the next event. 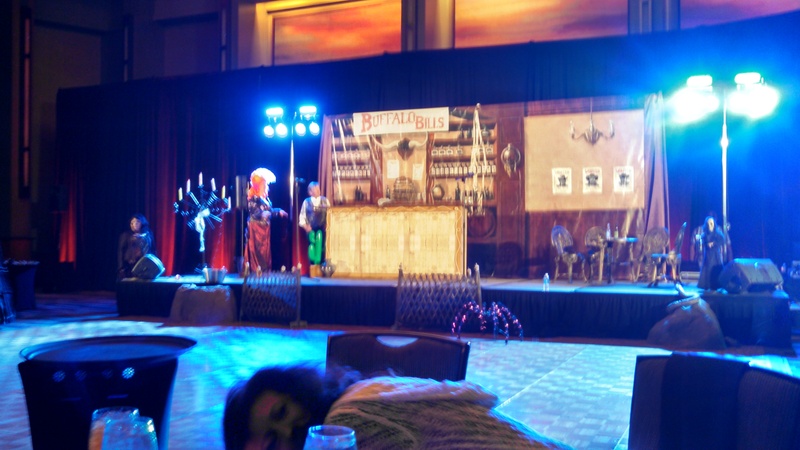 Most of the publishing houses host parties, spotlighting their authors. We receive books, have them signed by our favorite authors and eat the snacks they usually have. Not wanting to carry my books to the next event, I ran across the street again with Beth’s and my books while she waited in line (again) for the pub crawl. Earlier in the day, we received colored bracelets for the pub crawl. Beth and I were in the purple group. 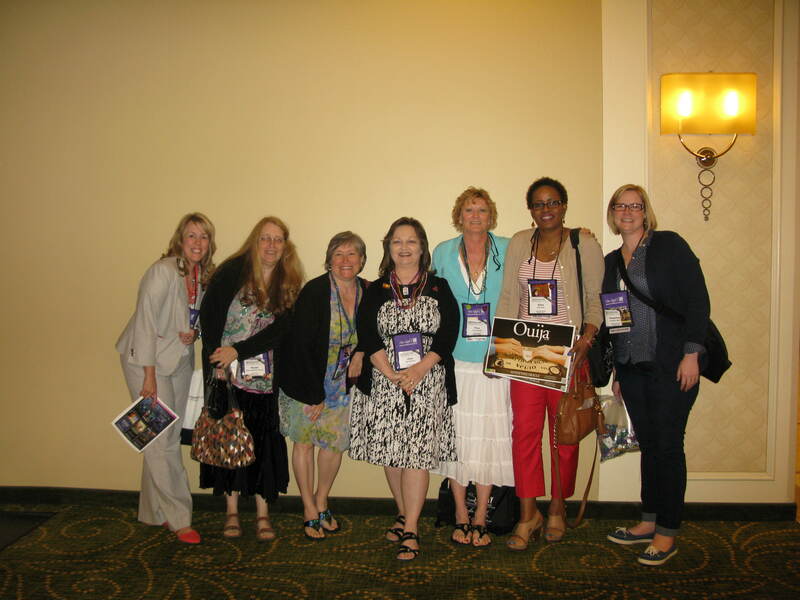 Geri Brousseau joined us and were herded with about 600 other purple women out of the hotel to Bourbon Street. I didn’t take long before we realized that somehow the three of us ended up with the yellow group. So we struck out on our own and headed to Pub #10 at the far end of the street. There were ten pubs we were supposed to go to, get the beads for that pub and go to the next. The night ended with another party with a DJ. Another round of meeting new people and having two women we’d met the night before join us. This was a dessert party, so we were glad we’d stopped for supper at the Napoleon House before going back to the convention hotel. Beth and I managed to stay until 11:00 before giving up the ghost and heading “home.” Another jammed-packed, fun-filled day. Once again I took a bunch of pictures on my cell phone during the night and couldn’t download them. I’m hoping my son-in-law can help me when I get home. So off to day three.